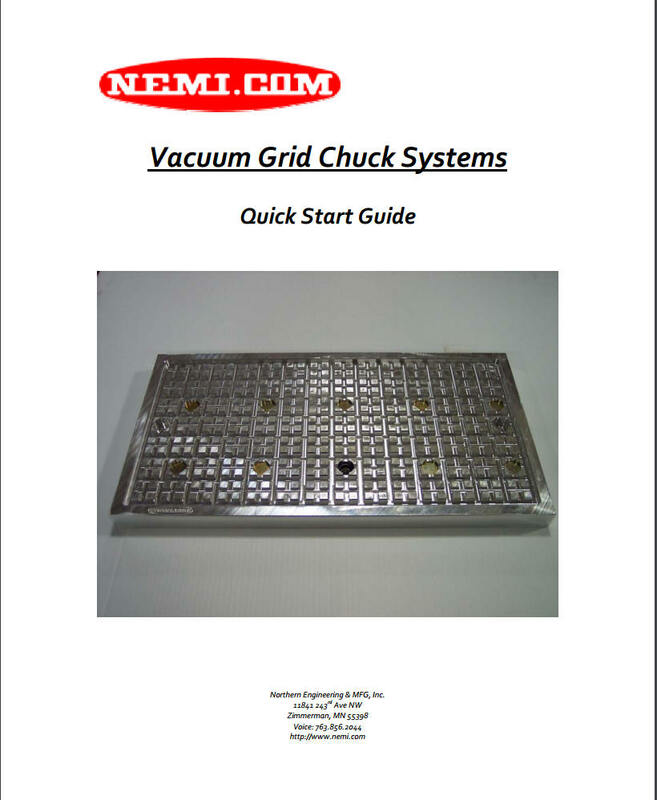 The NEMI Vacuum Chucks are an excellent way to add the versatility of vacuum workholding to your machining center, manual milling machine and surface grinder just to name a few. While the vacuum table kit doesn't replace a traditional machinist vise, it provides a platform for unique workholding strategies not possible otherwise. If you need to machine or grind flat plate plastics, aluminum, steel, carbon fiber or other materials, this is the system for you! These vacuum chucks also work great for engraving operations. Toss out that expensive double faced tape once and for all! These vacuum chuck systems can be bolted directly to a T-slot table or clamped in a machine vise. Optionally, these vacuum chucks can be configured for vacuum hold down to flat surfaces such as granite surface plates or surface grinder magnets. These packages come with everything you need to get set up and running in minutes! All you need to do is provide compressed air. For larger applications, check out our Portable Grid System. Please note that certain applications may require an upgraded vacuum generator. Features include (10) vacuum ports and a 3/8" NPT vacuum source connection. This chuck is an inexpensive, quick way to add vacuum workholding to your machining center. 3/8" ID Vacuum Hose - 15ft. 1/4" x 5/16" "D" Shaped Gasket - 15ft. The NEMI Curved Slider Vacuum Cups enable you to hold curved parts such as arched windows and furniture parts with ease.